"Devil With the Blue Dress On!" Definitely NOT for sale, this week's Friday Strat feature comes to us from Tom in Florida, a long time Stratoblogster visitor. He recently acquired this gorgeous '06 Deluxe Player's Strat through some horse trading on Craiglist. Tom's horse was a shred configured Ibanez RG350DX with a few accessories that he was willing to trade for a Strat. 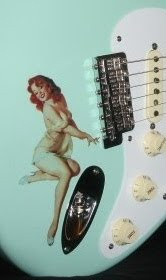 As it worked out, the Strat owner was crazy about Tom's Ibanez, resulting in an even trade and much happiness for all concerned. 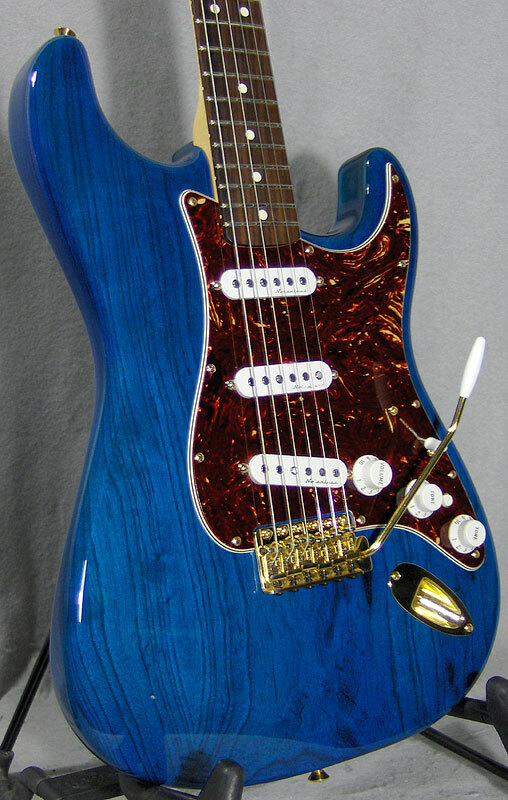 And this trans-sapphire on ash Strat still had the factory strings-- with nary a ding or scratch! How cool is that! Nice looking config with gold hdwr and tortoise pickguard, this model includes Vintage Noiseless pickups, 12" radius, modern "C" with 21 medium jumbo frets.